We are a dedicated team of women trained in Horticulture and Permaculture Design, specializing in the use of native plants that create or restore unique wildlife habitat and delicate forest ecosystems. Although Gaiaceous Gardens was formed in 2010, we have collectively over 41 years of professional landscape gardening experience between us. We’re also a group of dear friends; together we form a team that shares a love of nature and work efficiently together. We get many inquiries about our logo (mostly positive, unless the person hates Crows), so I thought it necessary to explain its origins and describe its meaning. This logo is an original piece of art, created for Gaiaceous Gardens, by Seattle artist AJ Power. The body of work he calls “Cherubs” caught the attention of my crew member Mac MacDonald, who then asked AJ if he’d be willing to collaborate with us on a logo. We were thrilled with the results! Our beautiful logo catches people’s attention as well as their imagination and illustrates the work that is at the heart of what we do at Gaiaceous Gardens. Thank you, AJ! 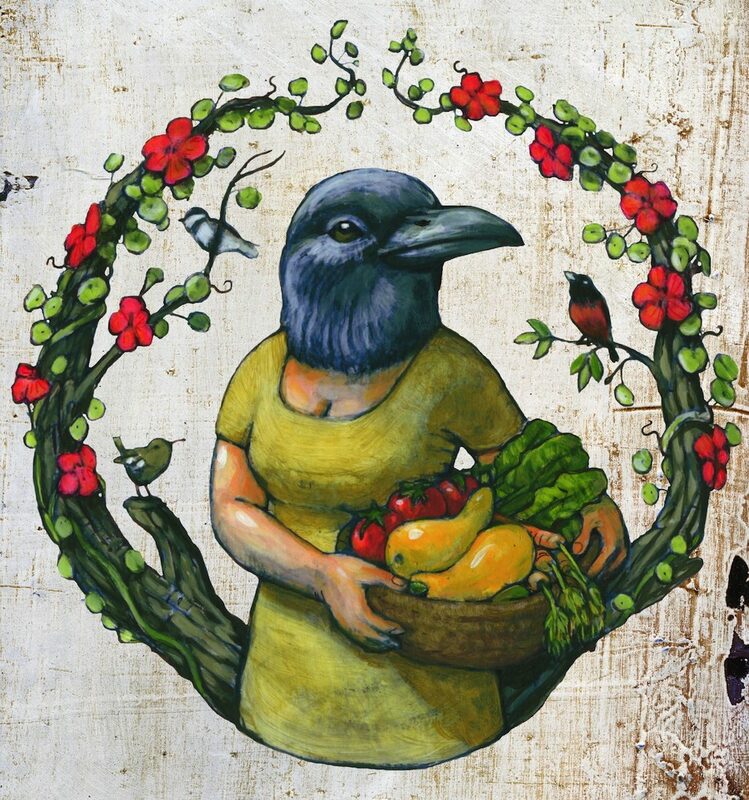 The image: A part Crow, part woman gardener and farmer holding a basket full of her latest harvest. She is surrounded by the branches of a climbing vine covered with Nasturtiums (a favorite flower at Gaiaceous Gardens, though not native to the Pacific Northwest) and several birds we see a lot of in most gardens: a Robin, a Wren and a Chickadee.